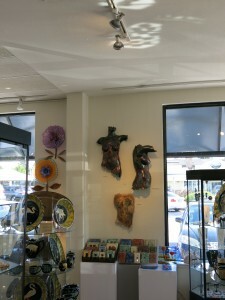 Many Hands Gallery at 510 Bay Avenue in Capitola shows a variety of artwork by local artists ranging from paintings, to pottery, to sculpture to jewelry. The store had halogen lights in the past but the store owner wanted to reduce her lighting costs, reduce the number of times she had to change failed lamps and reduce her air conditioning load so she converted to CFL PAR38 lamps throughout most of the store. A few halogens remain in the track lights and display cases. 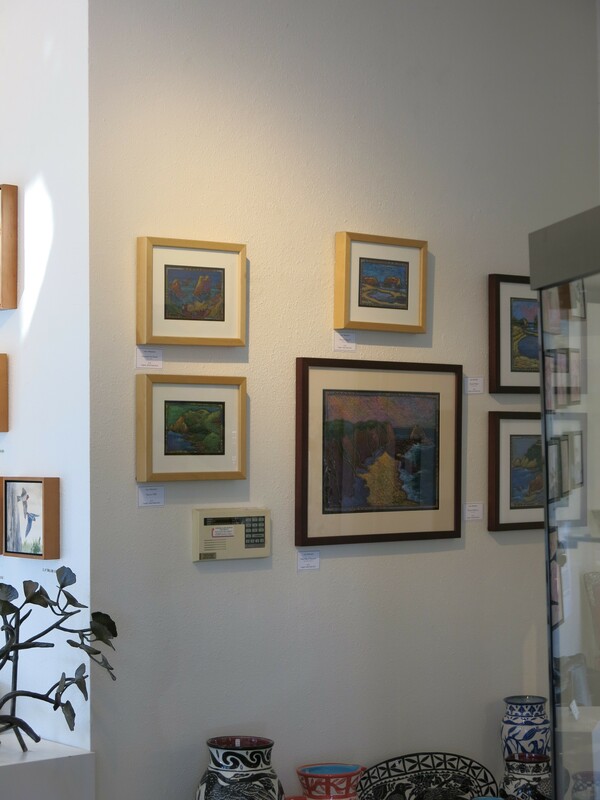 While the cost savings from converting to CFLs were realized, the lamps did not always bring out the best features in the displayed artwork or the store. The large emitting area of CFLs , while good at emitting a lot of light are limited in their ability to put focused light on an object. Halogen and LED lamps however are very good at putting focused light where you need it. In addition to the ability to focus and throw the light better than CFLs, LEDs can be better at accurately rendering the colors – making them look the way they would look under incandescent lights or natural daylight. The Many Hands Gallery has large, unobstructed windows allowing a lot of daylight into the gallery so the pieces show well because of this. 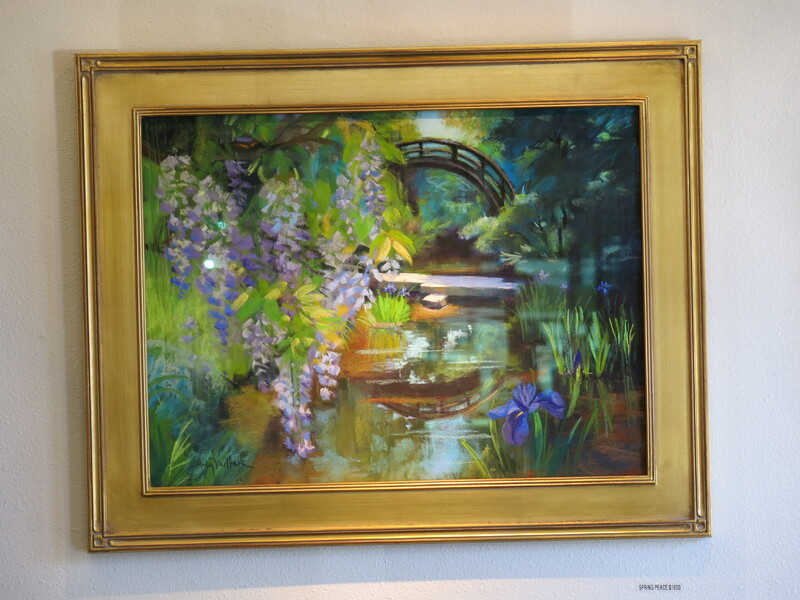 The addition of focused, broad spectrum LED light onto this painting right inside the front door however helps bring out the richness of the colors and the range of light with no glare, allowing the piece to be shown to its full potential. 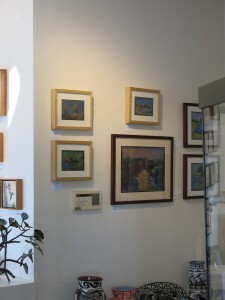 Here the PAR38 LED light is used to highlight the paintings that are around a corner. Even though it is a bright afternoon and the gallery is well lit throughout, this area seems darker by comparison. 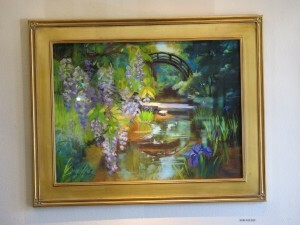 The addition of focused light opens up the space, drawing customers to the area while showing off the paintings to full effect. 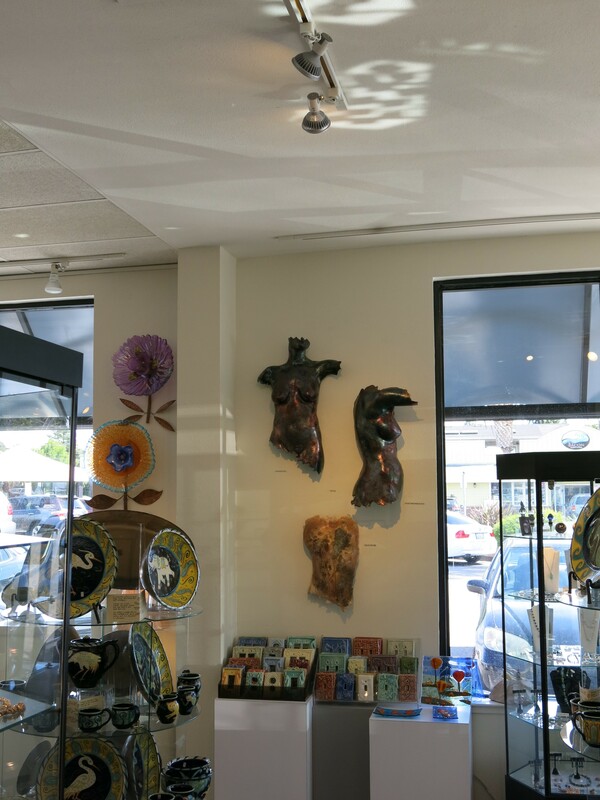 Experimenting with a handful of lamps resulted in several well placed LED PAR38 lights that significantly improved the quality of light in the store and the artwork being displayed. 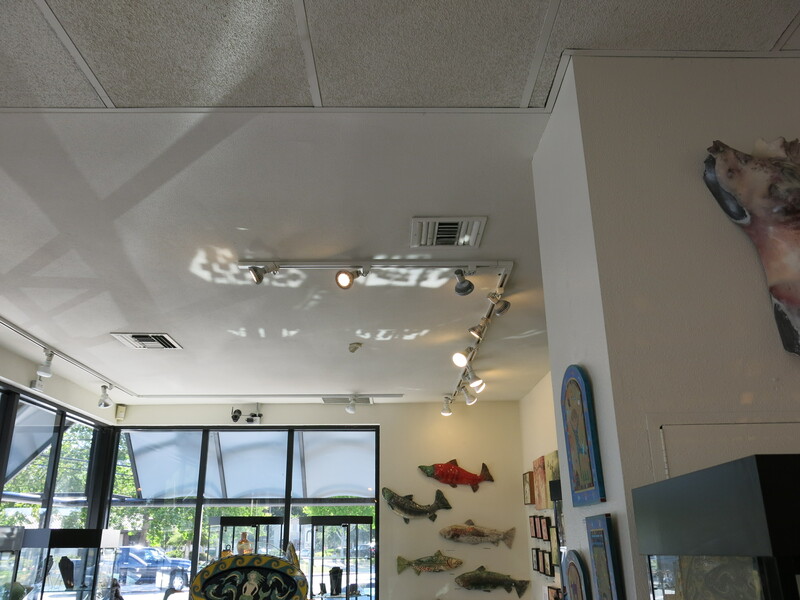 The owner is happier with the LED lamps and said that customers have commented, without knowing why, that the gallery looked lighter and better. All this while reaping the benefits of lower electricity bills and longer lived lamps. While there are a ton of new LED lamps on the market there are three agencies that are doing a good job of helping you make the best choices. These organizations want you to be successful in implementing LED lighting so do take advantage of their expertise. 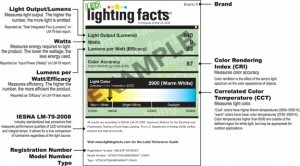 1) Lighting Facts at www.lightingfacts.com tests and labels LED lamps and luminaires. Buying product with this label helps you get what you need. 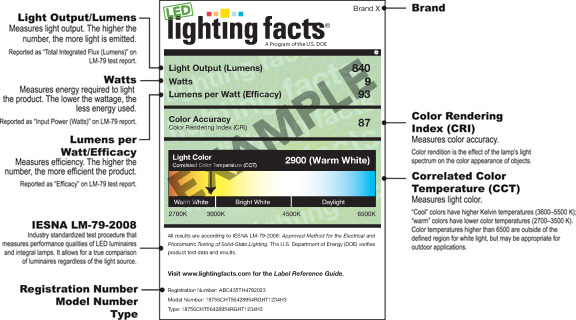 A few new metrics to learn when considering LEDs are 1) Lumens – this is a measure of how much light is coming out of the lamp or luminaire 2) CRI – this is a measure of the lights ability to accurately replicate the range of colors being illuminated, using natural or incandescent light as the standard. 100 is the best. 3) CCT – this is a number that indicates how warm – reddish or cool – bluish the color coming from the light is. A good starting point may be to get a range of CCT and CRI lamps and try them in different areas of your place and see which ones perform best in which applications. These lights will last for years so by doing a thorough job of testing you will be rewarded with years of good lighting. Once you have decided on the supplier, CCT, light output and CRI – file that information and use if for your subsequent purchases. Mixing lights with different values in the same area will probably result in you being unsatisfied with the results. This site has a list of all the Energy Star certified lights. For commercial applications an Energy Star certification is recommended. This site also explains about possible rebates. Energy Star or DLC certifications are always required to qualify for rebates. This consortium keeps an updated Qualified Products List of all LED – also known as SSL (Solid State Lighting) products.